I just released something on npm! Actually, my resume theme (Eloquent) has been available in the npm repository for over a month, but now it just reached 1.0.0. I created this JSON Resume theme when I was looking for a new job. My aim was to make sure that I’d be able to deliver a full-lenght version of my resume if needed. 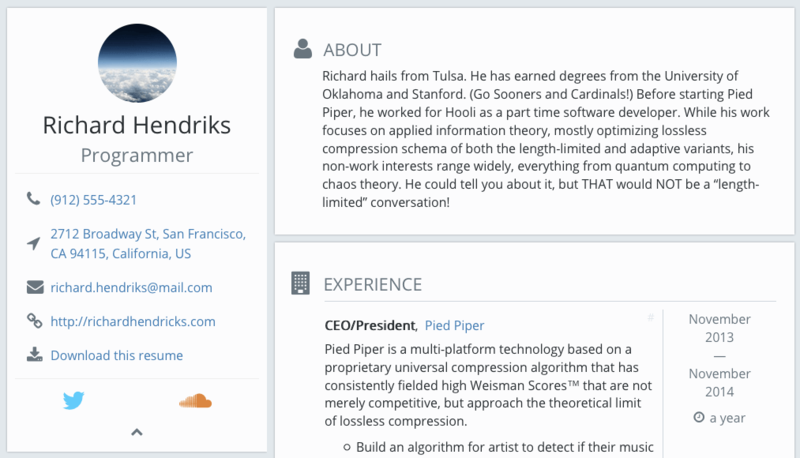 I started by retrieving my LinkedIn data, and used the Elegant theme. Download your resume with a single click, in a single file. Keep your resume offline if you want to: the theme is self-contained. Obfuscates your email address and phone number from spam bots. Gorgeous Open Sans web font. Optimized for print and screen readers. Contains Schema.org markup to make the most of your content. All fields are optional, pick what you need! IMHO it is much more important for a resume to look great than for a portfolio. The resume may be the first thing any recruiter will look at, and first impression matters. A lot. That’s why the theme is quite boring to look at — its most important feature is to make your content stand out. Here’s the result on my own resume: thib.me/resume.